The Interface preferences control how some aspects of the program appear . Tool tips are notes that appear when you pause the cursor over an onscreen element . The Interface settings of the Preferences dialog box. An example of a tool tip that appears when you pause over an interface element. Normal waits a moment before displaying the tip. None turns off the display of the tips. Fast displays the tool tips almost immediately. The Cursor Options let you change how the mouse cursor behaves. Deselect the option Show Thumbnails on Place to see only the cursor, and not the thumbnail preview, for placed text and images . The thumbnail preview next to the Place cursor. Deselect the option Show Transformation Values to see only the cursor, and not the transformation values as you draw and modify objects . The transformation values that appear as you create or modify objects. 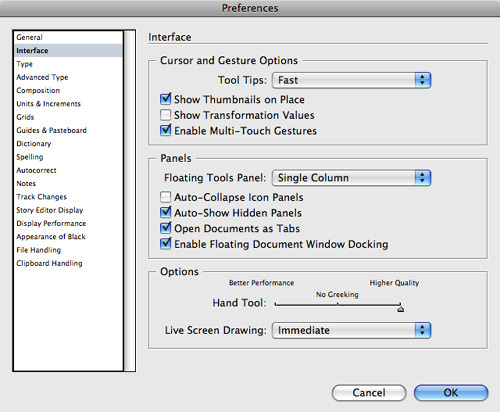 You can also control whether InDesign allows you to use the multi-touch gestures for trackpads and mice. Deselect the option Enable Multi-Touch Gestures to avoid input by two or three fingers on trackpads and mice that use that feature. The default for the Tools panel is a single column. But you can change that setting. 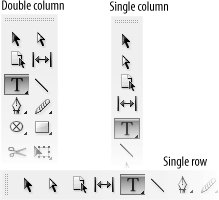 Double column shows the tools vertically in two columns. Single column shows the tools vertically in a single column. Single row arranges the tools horizontally in a single row. The arrangements for the Tools panel. 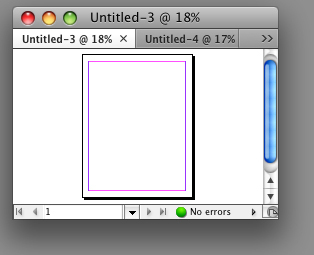 Click the two arrows in the Tools panel title bar to shift between the three settings when it is not docked. You can also change how the panels and documents behave. Select Auto-Show Hidden Panels to display any panels that were hidden by pressing Tab or Shift-Tab when the cursor moves over the hidden panel area. Select Open Documents as Tabs to combine the windows for new documents into a tabbed display . An example of documents arranged in tabs. Select Enable Floating Document Window Docking to allow floating document windows to dock as tabs into other windows while being dragged.